Touch, pause and engage with Microgaming’s 5 X 3 reel Rugby Star online slot, and celebrate the 2015 Rugby World Cup with 243 ways to win! 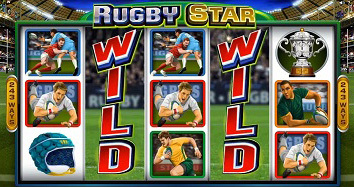 Rugby star is a non-progressive video slot packed with awesome features, including Rolling Reels and Multiplier Trail. The Rugby star logo is Wild and substitutes for all symbols except the Scatter. During the base game Stacked Wilds show up on reels 3, 4 and 5 and up to 40 Wild symbols can be stacked differently across the reels. With the Wild Pass feature, reels 2, 3 or 4 can turn entirely Wild, securing a guaranteed win. Up to 2 Wild Reels can be randomly triggered at a time. The Scatter symbol is the rugby ball, and landing 3, 4 or 5 anywhere on the reels will trigger 15, 20 or 25 spins in turn. The Rolling Reels feature is activated during the free spins round which can lead to sequential wins. After every repeated win the Multiplier Trail counter increases, and total winnings get multiplied up to 10 x. . The minimum bet is 0.5 and coin sizes can range between 0.01 and 0.10. Max bets could go up to 50 coins per spin. Rugby Star averages winnings on every 3rd spin, and x250 is the potential jackpot payout. Gambling sports fans will adore the graphics and added apt affects Microgaming has put together for this exciting slot. And the 243 paylines plus special bonus features mean winnings are relatively easy to come by.